I want to begin by publicly thanking Bishop Tobin for being here with us today. Bishop, it means a lot to me to have you present for this celebration. You know, Bishop Tobin did not send me to St. Pius, Bishop Gelineau did back in 1988. 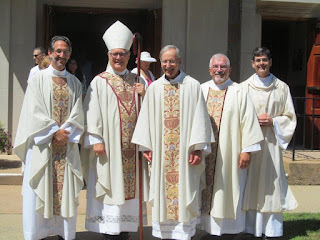 But Bishop Tobin allowed me to remain here as pastor longer than many bishops would have, and he even gave me the option of staying here after my “retirement,” which I am deeply grateful for. And all of this after my Green Bay Packers beat his Pittsburgh Steelers in the Super Bowl! If I had been in his shoes, I would have sent me to Siberia—immediately! It just shows that he’s a much better man than I am. I also want to thank Fr. Najim for being the driving force behind this day and this celebration. When he first proposed the idea, I said I wouldn’t object to having “a little something” in my honor. Well now I know that, even though we agree on matters of faith and morals, we have different definitions of the word “little”! But I am grateful to him—especially since we’re raising money here for our school, which has always been near and dear to my heart. Finally, I want to thank the members of the committee who did all the work behind the scenes, and anyone else who helped in any way, like the choir and Knights. I don’t know who you all are—but God knows. May he reward you for your charity and kindness. A couple of weeks ago, I watched an old video: a video that I had taped off the local cable channel back in 1990, less than 2 years after I had come to St. Pius. It was a video of that year’s Mt. Carmel procession. It brought back a lot of great memories. And, as I watched it, I realized how much has changed since then in Westerly and in the world—even in terms of the hairstyles! Most of the younger girls who were there had that 80s “big hair” look; the younger guys had their “mullets.” I had a black beard and dark hair—and, of course, a lot more of it! But most of all I noticed the number of people—the large number of people—who marched that day and who are no longer with us—starting with my mom and Fr. Najim’s mom—who walked together and who prayed the Rosary together in that procession. I had forgotten that. It was probably the last event of that type that my mother ever participated in. She died of cancer on October 1st of that year. It’s my prayer that she and Mrs. Naj are now marching together in another place, along with Fr. Dean Perri’s dad and all the others in that video who have since gone home to the Lord. A lot has changed since September of 1988, when I moved into the house at 44 Elm St. and became the assistant pastor of St. Pius X Church under Fr. Joseph Besse. But some things have NOT changed—and for these I praise God; for these I am especially grateful today. One thing that has not changed is that St. Pius X Parish is still a “spiritual powerhouse”—to coin an expression from Bishop Tobin. Those words of today’s first reading, “my house shall be a house of prayer for all peoples” apply in a special way to this place. There are many people in this parish (and in this community) who have the faith and perseverance of the Canaanite woman in today’s gospel. I noticed that when I first came to Westerly. I also noticed that there’s a cultural support to the faith here that you don’t find in too many places. I am still amazed, for example, at how many people drive by this church every day and make the sign of the cross on their foreheads. I see it all the time. You don’t observe that kind of behavior in most other towns. Even many of the “unchurched” and disconnected people here often have a remnant of the faith that they cling to—even if it’s just a brown scapular that they received at a Mt. Carmel procession one year and now have hanging on the rear view mirror of their car. I gave a retreat on spiritual fatherhood recently to the seminarians of the Diocese of Springfield, and in one of the talks I made note of the fact that every parish has its “core”. The core is made up of those people who really love God and the Church and who want to be nourished with the truth of the gospel. They’re hungry for it. Every parish has a core, but not every parish has a core as large and as diverse as this one has. Neither has the fact that St. Pius is a seedbed for vocations! In the last 25 years we’ve been blessed to have many young people (and some not-so-young people!) from our community say yes to Jesus’ call to serve him in the priesthood, the diaconate and religious life. It’s been an incredible grace from God, and I feel so humbled and so blessed to have been a small part of it. And the grace continues! We have a number of young people who are discerning the call right now as we speak—in addition to Joe Brodeur and Zach Sexton who are already in formation—and I praise God for that! It’s an amazing phenomenon, to say the least. Some people, I’m sure, think I pressure young people into these vocations, but I can assure you I do not! In fact, I don’t even discuss the subject with them unless they want to talk about it. My philosophy for ministry to youth has always been very simple: You help them meet and experience Jesus Christ; you teach them the truth of the Gospel with clarity and conviction (in other words, you don’t water it down in any way); you teach them that the most important thing in this life is to do the will of God; and you try to be a good example to them. And even if you’re a very poor and imperfect example like I am, in most cases those young people will figure things out for themselves. They’ll come to see that Jesus Christ is worth investing your life in—and they’ll hear the call, without any prompting from me or anyone else. And then they’ll get the support they need from the people of our parish and school—which is so necessary and important! You tell the people of St. Pius that you’re thinking of being a priest or religious, and most of them are genuinely happy for you. That’s not the case everywhere. This is a “nurturing environment” for vocations. That’s why our summer seminarians always come back to visit us! They come back because they know they’re supported—and prayed for—here. 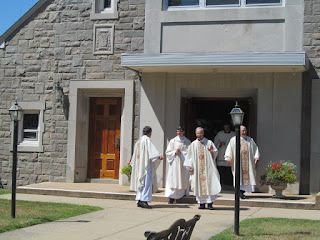 In fact, once a seminarian has a summer assignment at St. Pius, we pray for him as a parish family at every single Sunday Mass until he’s ordained to the priesthood. And they appreciate that. I want to conclude today by making it clear that I haven’t said all that can be said, simply because there’s far too much to say. I could talk, for example, about the wisdom I learned here in the last 29 years from great priests like Fr. Besse and Msgr. Struck. I could talk about the great men and women on staff at the church and the school whom I’ve been privileged to work with—most of whom have “gone the extra mile” for me and for the people they serve. I could talk about the incredible charity of the people of St. Pius: how this is a community that takes the corporal works of mercy seriously; how whenever I’ve asked for money for something we’ve needed, I’ve gotten it—and then some! It’s been 29 years of great graces and blessings. Yes, there have been difficult times (lots of them); yes, there have been tragic moments along the way (especially the tragic deaths of some young people). But, knowing what I know now, would I do it all again? Number 1: I’m really glad I’m Italian. And, number 2: I’m really glad I was young in 1988—because they told me at the time that Bishop Gelineau wanted a young, Italian priest to replace Fr. 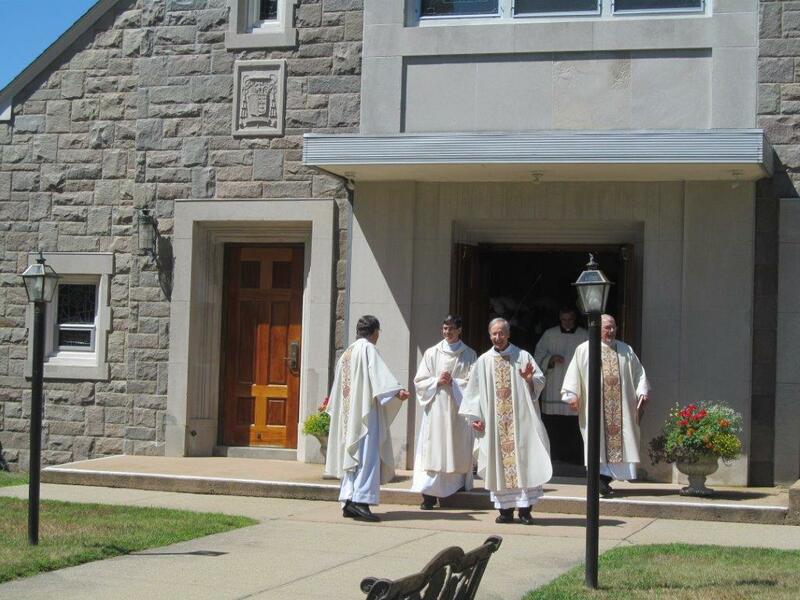 Santilli at St. Pius X Parish in Westerly, and I fit the bill! I have been greatly blessed to be part of what Almighty God has done here in the last 3 decades, and I’m thrilled—and deeply grateful—that now, in my retirement, I can still be part of it. Some of you have probably seen the newly-released movie, Dunkirk. It’s based on a very important—and in some ways decisive—event that took place in the early days of the Second World War. To the south and east the Nazis pressed. To the north and west stood the sea. Not an enviable position for any army. If those men were forced to surrender, Britain would’ve been easy pickings for Germany. World War II might’ve ended with a swift German victory, and Western Europe would’ve been a massive enclave of Nazi power. Getting those troops across the English Channel quickly was imperative. But how do you that when you have 400,000 to transport? What followed was what Churchill (who was not the most religious guy on the planet) later called “a miracle of deliverance.” Many believers would say that it was God’s response to the prayers that were offered all over Britain after King George VI called for a national day of prayer to take place on Sunday, May 26. At least 3 extraordinary things occurred in the days surrounding that day of prayer. First of all, the German army, acting on orders from Hitler, stopped about 18 miles outside of Dunkirk and delayed their attack, giving the Allies the time they needed to begin an evacuation. Secondly, four days after this so-called “Halt Order” from Hitler was given, a terrible storm developed over Flanders, grounding the German Luftwaffe and giving the Allies more time. And thirdly, even though there was terrible weather nearby, the English Channel in the area around Dunkirk was incredibly calm—which it almost never is. One eyewitness said it was as “smooth as a millpond.” This enabled ordinary people in their pleasure boats and small commercial fishing vessels to help in the rescue effort. They were able to get close to the beaches (where the big, military vessels couldn’t go) and to save tens of thousands of men who otherwise would not have been evacuated before the Germans moved in. 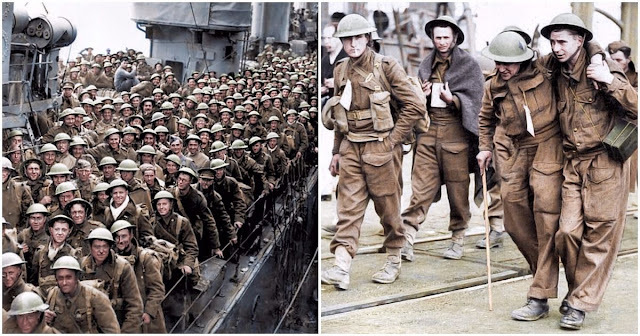 British military leaders were hoping they could rescue 45,000 of the 400,000 soldiers trapped at Dunkirk, but amazingly more than 330,000 made it to safety in England. Many, including Churchill, called it a “miracle”. I prefer to call it a “transfiguration moment.” A transfiguration moment occurs when we believe that God has manifested his presence to us in a special and powerful way—a moment when it becomes clear that God is real, and alive, and with us. Now the interesting thing about this transfiguration moment is that it occurred in the middle of a war! The context of the experience was decidedly negative. The original transfiguration experience, on the other hand—the one we heard about in today’s gospel reading from Matthew 17—was glorious! It happened on a mountaintop, in an atmosphere of faith and love and holiness. It was so glorious, in fact, that Simon Peter wanted to pitch camp there and stay a while! He didn’t want it to end! But not all transfiguration moments are like that. Some are—and we should thank God when they happen (as they do for many teenagers throughout the country at the Steubenville youth conferences every summer. That’s one reason we go.). But many are not so positive. I have known many people, for example, who have experienced God’s presence and strength and consolation after they’ve lost a loved one or after they’ve gone through some other serious trial in their life. For them, those moments, although painful and difficult, have been transfiguration moments—the same type of transfiguration moments that many of those Allied soldiers experienced as they were crossing the calm English Channel to safety in late May and early June of 1940. It is possible to experience a transfiguration moment and not be aware of it until many months or even many years have passed. But once we become aware of one, it’s important that we never forget it, because there will be difficult times in the future when the memory of that transfiguration moment will give us the strength and the encouragement we need to remain faithful. Jesus gave his disciples a little glimpse of his glory on Mt. Tabor so that they would have something to hang onto when almost everyone else turned against him on Good Friday. I’m sure that when the soldiers of Dunkirk (the ones who are still alive) are having a difficult or frustrating day in their old age (most are probably in their 90s now) their minds go back to the day 77 years ago, when they had their own Mt. Tabor experience on the sea between France and England—and they draw strength from that memory. That’s the power of a transfiguration moment when it’s recognized—and remembered—by a person of faith. May God help us to know that same power in our lives.